Stunningly magnificent! As you enter you will immediately be taken by the view of the well manicured back yard and dazzling pool. 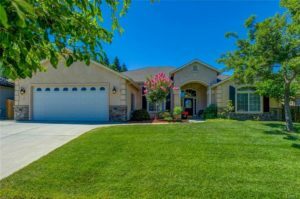 This home has everything you could want and is located in a wonderful neighborhood close to schools and other conveniences. The kitchen has recently been refurbished with granite counters, glass subway tile backsplash and all new stainless steel appliances. Truly a room that will inspire you to create multiple culinary delights. At the end of the day you can drift away from your worries in your outdoor haven as you listen to the sound of gently falling water from the water feature in your pool. Or, perhaps you’d rather soak in the jetted tub in the huge master bathroom and roll into bed early for the night. Enjoy the open and flexible floor plan, vaulted ceilings, gorgeous flooring and so much more. All this and it is solar powered by an owned system with recently updated panels and inverter. Pick up the phone and call your Realtor today to make an appointment for a private tour of this sensational home!